soundimageplus: Leica M9 Olympus E-P2 Voigtlander lenses. Leica M9 Olympus E-P2 Voigtlander lenses. Still winter continues with its combination of cold temperatures and sunny days. I cannot remember a winter with so many photographic opportunities. Yesterday I went to a couple of locations, using a kit of a Leica M9 with a Voigtlander 35mm f1.7 Ultron and a Voigtlander 75mm f2.5 Heliar. I also took along my Olympus E-P2 to use as a "teleconverter" for the 75mm - becoming a 150mm (35mm equivalent) It also gave me the opportunity to try the 35mm on m4/3. The first location was "Ambridge" For non-UK readers Ambridge is the location of a long-running radio serial called The Archers, about farming folk, which has been, somewhat incredibly, running since 1950. It is a British tradition, in the same vein as roast beef and yorkshire pudding and the inability to run trains in the snow! The fictional location is based on real locations close to where I live. 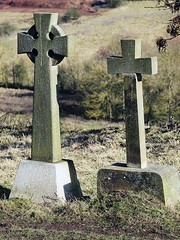 These are images from the site of the church of "St. Stephens" in the serial. Which in reality is Hanbury church in Worcestershire. 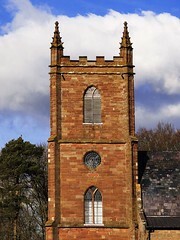 This church has a wonderful position on a hill with far-reaching views of the farmland which is so typical of the area. It was so cold taking these pictures that it took about 10 minutes to get my hands working again using the car heater! The second location was a nearby canal. 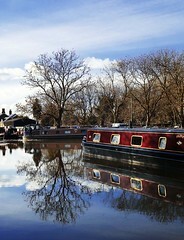 Those of you who read this from time to time will notice a large number of canal images. It is a particular favourite subject of mine. 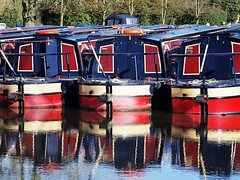 The British Inland Waterway system is one of our gems. It was the first of its kind in the world, and being the first was built too narrow to survive as a long-term transport system, being quickly superseded by the railways. 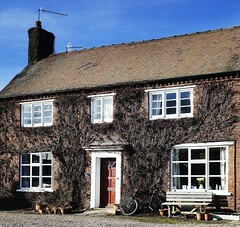 It had languished semi-derelict for many years until being renovated from the 1960's onward. 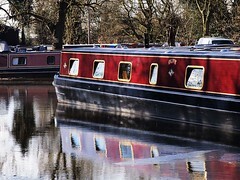 It is said that half of the British population live within 5 miles of a canal or navigable river. The very reasons that made it fail are the reasons why this waterway system is now such an attractive part of our landscape. 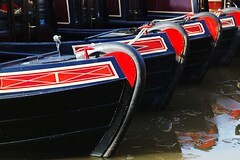 It was too narrow and too slow relying on lock gates to get up and down slopes. Those countries that built canal systems after us, built them wider and straighter. They may still be used commercially but are often ugly scars in the landscape. 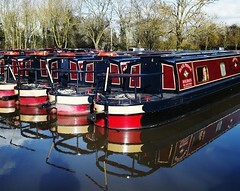 The British Inland Waterway system, with its colourful narrow boats and scenic towpaths is now a leisure facility. There are occasionally long term rewards for getting things wrong! Several things emerged from the day. Firstly with regard to my "Open letter to Leica"
There's a good explanation of how this system works halfway down the page of this link. The Olympus viewfinder is sharp and clear, the magnification system gives accuracy for focusing, but the Rangefinder system, once you get used to it, is superior in terms of clarity and speed. I reckon it took me at least 3 times as long to focus lenses on the Olympus as it did on the Leica. The great advantage of the Leica Rangefinder focusing system is that you can use it without moving any of your fingers or hand away from the picture-taking position. Its seamless. With the Olympus its pressing buttons and a constant moving of the hands. After a while it becomes uncomfortable and to be honest, a real pain. With the Leica its actually a constant pleasure. In many ways I prefer it to AF. No lenses whirring away, hunting back and forth, and of course no changing focus once you've set it. I really cannot believe how people think that an EVF / Live view system is preferable for Manual Focus. Its being touted as "quicker" Well its not. Its also been said that its sometimes difficult to find a clear edge to use the rangefinder metering field with. Well with apologies to the partially sighted, only if you're semi blind. The whole idea is a nonsense. Fortunately I'm sure Leica believe that too. 35mm F1.7, 70mm f1.7, 75mm f2.5, 150mm f2.5. No serious wide angle here, but there's another Leica advantage here. 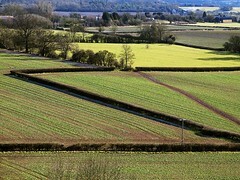 It is incredibly quick to shoot multi-stitch panoramas. One focus point then pan and shoot. After working with the 35mm, I realised how much I love this focal length. I am constantly surprised when I bring the camera to my eye, how often I just say "Thats it" & press the shutter. Far more than with any other focal length. One day I'll try to work out why that is. All in all, a successful and enjoyable day.